The Amnesty Inter-national, public stat-ement of over 8000 words long dated 2 September, 2014, implicitly questioned the legitimacy of, and denounced media gagging and police terror let loose by Sheikh Hasina’s government as follows: “The government of Prime Minister Sheikh Hasina continued in office after her party, the Awami League, was declared the winner in the 5 January 2014 elections. 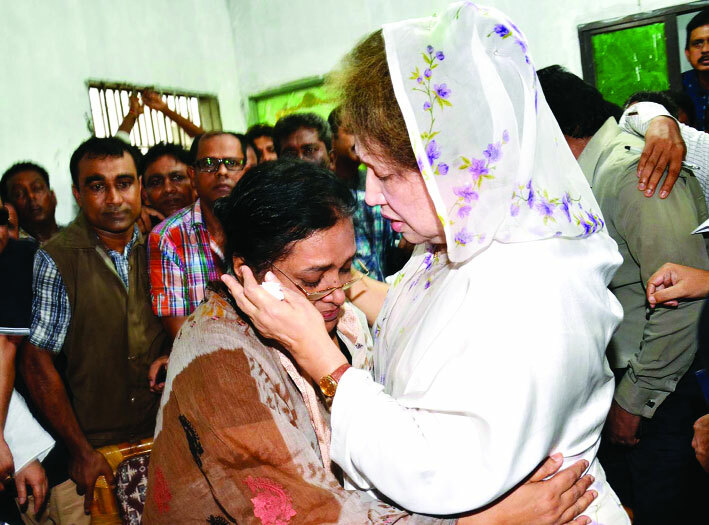 The elections were boycotted by the opposition party, the Bangladesh Nationalist Party, and its allies. The opposition protests against elections were frequently violent resulting in more than 100 people killed, most of whom died in violent clashes between the police and protestors. “To Amnesty International’s knowledge, no police or security officials involved in the operations that resulted in those deaths have been investigated through an independent and impartial mechanism. Consequently, no one has been brought to justice for any unlawful killings. Making mention of its report “on a catalogue of human rights violations in Bangladesh in recent years, which are ongoing and have not been addressed,” the Amnesty statement focussed on “three of the most pressing concerns that have a long history and which have continued in 2014: enforced disappearances, torture and restrictions on the right to freedom of expression.” The statement said Amnesty investigated 20 reported cases of enforced disappearances in Bangladesh since 2012, including seven who forcibly disappeared in April 2014, out of presumably many more unreported or suspected cases of forcible disappearances. (Of late, such disappearances have become so rampant under an open general license apparently given to ransom-seeking greedy police officials and criminal gangs that even the pet Opposition in the parliament could not keep quiet and embarrassed Sheikh Hasina raising the matter of ‘abduction rackets’ on the floor of the House). The Amnesty investigation on 20 reported cases of enforced disappearances gave its findings as follows: “Of the 20 men, nine have been found dead after their disappearance. Six have returned to their families after periods of captivity lasting from weeks to months with no news of their whereabouts until their release. There has been no news about the circumstances of the other five. “There have been several cases in which a group of between five and 12 men in plain clothes have announced themselves to the victims or others in their proximity as police or RAB officers before taking the person away. The vehicles and weapons used by these men have also led eyewitnesses to identify them as police or RAB personnel. In some cases, the motives for the enforced disappearances appear to have been political, with the targets being members of the opposition parties. At least eight of the 20 people mentioned above have been prominent members of the BNP or Jamaat-e-Islami. In some other cases, enforced disappearances have been linked to allegations of corruption. In at least nine of the 20 cases investigated by Amnesty International, the families have alleged that local influential persons bribed RAB personnel to carry out enforced disappearances against business rivals or adversaries. The statement gave details of findings on recent (1) Enforced disappearance of seven persons in Narayanganj, discovered smothered knifed and dumped in the river, (2) Possible enforced disappearance and release of Abu Bakar Siddique, husband of human rights activists Rizwana Hasan, (3) Possible enforced disappearance and dubious, circumstances of death of a Hospital employee in Bogra, Abraham Linkon, and (4) Enforced disappearance of Saiful Islam Hira, former Opposition MP of Laksam and his cousin, along with another opposition activist later disappearances of Ilias Ali, Opposition BNP leader of Sylhet, and his driver Ansar Ali, still untraced, and of Trade Union leader Aminul Islam, whose tortured and maimed corpse was found on roadside a day later. The statement then reminded Bangladesh that customary international law prohibits enforced disappearances, and Bangladesh has international obligations as a state party to the International Covenant on Civil and Political Rights (ICCPR), as enforced disappearances violate a number of rights in the covenant, including the right to liberty and security of person and the right to fair trial, and, in particular cases the right to life. Highlights of a few cases were narrated, such as the case of a detainee who died in hospital after police allegedly shot him in the leg, February 2013, that of detainee who died in hospital after police allegedly shot him in the leg, January 2014, and that of police torture that two Bihari brothers, one of whom died from his injuries, February 2014. The statement reminded the present Government of Bangladesh that it’s own Constitution (Article 35), Penal Code (Section 330) and the Torture and Custodial Death (Prohibition) Act of 2013 prohibits use of torture and other ill-treatment. Under this section, people can be sentenced to a maximum of 10 years in prison, if the charges were brought against them before 6 October 2013. At that time, an amendment increased the maximum punishment to 14 years in prison. The amendment also imposed a minimum punishment of seven years. But will Sheikh Hasina’s government listen? The regime is deaf to the woeful cries of thousands of families affected by floods in many parts of the country, thousands more rendered homeless right next to the capital by disastrous river erosions along the river Padma almost reaching Mawa Ghat end of the proposed Padma Bridge. The regime is fond of only hearing its own voice when it talks big about spending the state’s own money to build the bridge and sing its own claim to glory for laying the foundation stone of the bridge. A regime that treats its people as ciphers, defiles their human dignity at will by torture, and flouts its own laws at random, condones custodial misconduct and contract killings by its law-enforcers cannot be expected to listen to reason or to the dictates of human conscience and international law.